Electric guitars play a big role in nearly every type of music these days, and the amplifier is a huge part of the equation. Guitar amps might seem complicated, but they’re really just a lot of simple electronics wired together, and it doesn’t take too long to fully understand what’s going on in there. Plus, working on your amp when something is wrong can be both fun and rewarding, not to mention possibly essential if you’re on the road and in need of a quick fix! So here’s a basic overview of how amps work and what you can do to start tweaking your own. At a basic level, these pickups convert the magnetic energy of the metal strings vibrating against the pickup into electrical energy, known as voltage. Next, it can be made louder, of course, with the help of a huge newfangled box known as an amplifier. + Learn more on Soundfly: Whether you’re recording your first demo or a new album, make it sound professional with our free course Demo Recording 101! From there, a man named Leo Fender began building amplifiers out of his radio store. 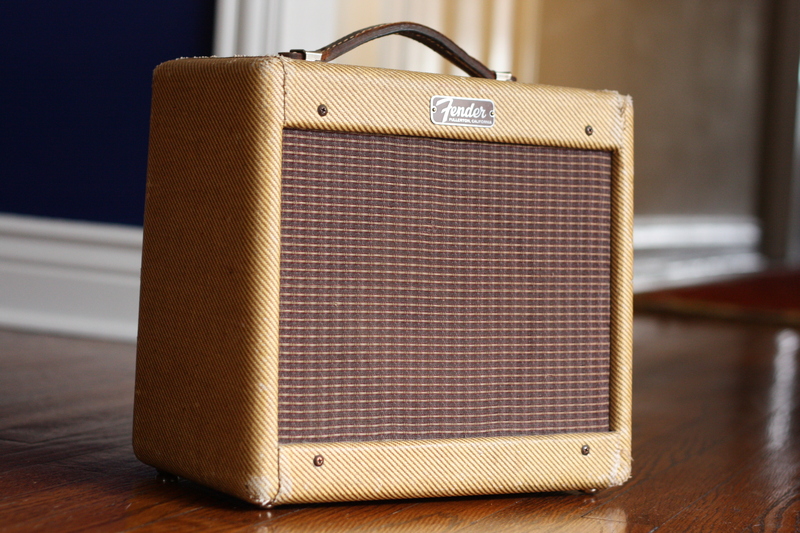 He started with simple amplifiers like the Fender Champ, but quickly added tone controls and reverberation. All of these new features are huge topics worthy of their own articles, but suffice to say Leo became one of the founding fathers of the guitar amp… Oh, by the way, he also invented the Telecaster and Stratocaster. They’re pretty important to the history of electric guitar, as well. Rock historians might say that Leo Fender’s most important amplifier was in fact the Fender Bassman, which — despite being a bass amp — paved the way for the creation an entirely new kind of amplifier, crafted by the other father of guitar amps, Jim Marshall. To this day, regardless of the sticker on the front, most amplifiers are defined as either “Fender-style” or “Marshall-style.” Still, there are a thousand variations and that’s where it gets fun. Understanding audio tech requires some basic knowledge of electronics, and amplifiers are no exception. Thankfully, the internet has many great resources — scroll down to the end of the article for more information. There are a lot of parts to making an amplifier work, but the main contributor is something known as a vacuum tube. This tube is a small, air-tight piece of glass with some fancy metals inside that heat up and cause voltage to rise exponentially. This voltage can later flow into a different magnet (remember the pickup? It’s like that, but in reverse), which pushes a speaker into making sound. Loud sound. Tubes must heat up before they start to work, and amp makers suggest letting your amplifier run for about thirty seconds before playing. Most amps also have two power switches: one to turn the amp on, and the other to control “standby” mode. This protects an amp by only putting voltage to the “heater” part of the tube. The first tube listed is a pre-amp tube, and the others are power tubes. Generally, power tubes are much larger because they have to handle greater voltages. These tubes also have a lot of alternate names and many special variations, so be careful when you buy one. 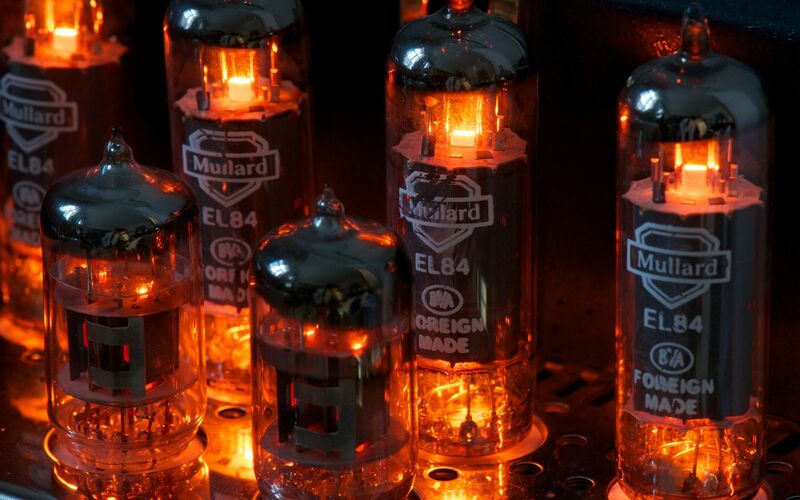 If you’re looking to design or repair amplifiers, you’ll want to become very familiar with a tube’s data sheet, which has all the info on the tube’s behavior. Now here’s where the creativity comes in. Amplifiers can vary largely between different models, and even the smallest variation can have a drastic effect on an amp’s sound and tone characteristics. First, there’s a basic circuit — known as a tone stack — comprised of most controls on the front of the amp. The three best-known tone stacks are one knob (like the Fender Champ or Tweed Princeton), two knob (like the Fender Twin), and three knob (like the Fender Bassman or Marshall JTM45). These tone stacks affect the amp’s EQ channels, and the values of the electrical components used in making them are what define an amplifier’s sound. Here are some common tone stack circuits, courtesy of monster.party.hat. You can also use effects after the guitar signal passes through the pre-amp. This includes things like reverb, delay, or chorus. Amps also often have an effects loop, which allows you to plug in your own effects pedals after the pre-amp. Finally, the speaker makes a huge difference in the final sound your amp makes. Speakers are so diverse and so important that it would take hours to cover! Still, most speakers have an “American” sound (articulate with a cut in mid-frequencies, used in Fender amps) or a “British” sound (lots of aggressive mid-frequencies, used with Marshall or Vox amps). When you put it all together, an amplifier can be built to suit a genre of music, to cover many sounds, or to simply get loud without coloring the sound. An amp is one of the most important choices a guitarist can make in how they express themselves, beside developing your pedalboard identity, so it is important to learn how they work. Knowledge of amp’s sound is what allows you to say what you want with the voice you want. + Learn more on Soundfly: Learn everything you need to know to book, manage, and promote your band’s next national tour with our free course, Touring on a Shoestring! Working on amps is a great place to learn what makes your audio gear tick. Before you do anything, read up on electrical safety. Guitar amps use very high voltages, and if you aren’t careful, you can electrocute yourself, leading to injury or possibly death. Fortunately, every book written about amplifiers covers safety in the first chapter, so read it well! The Tube Amp Book by Aspen Pittman — If you read this whole article, you probably already own this book. If you don’t, you’ll want it. Half the book is a bio of nearly every amp company in history. The other half has nearly 800 schematics for common amplifiers for research. Design and Construction of Tube Guitar Amplifiers by Robert Megantz — This is a great book to get involved in the theory of amplifiers. 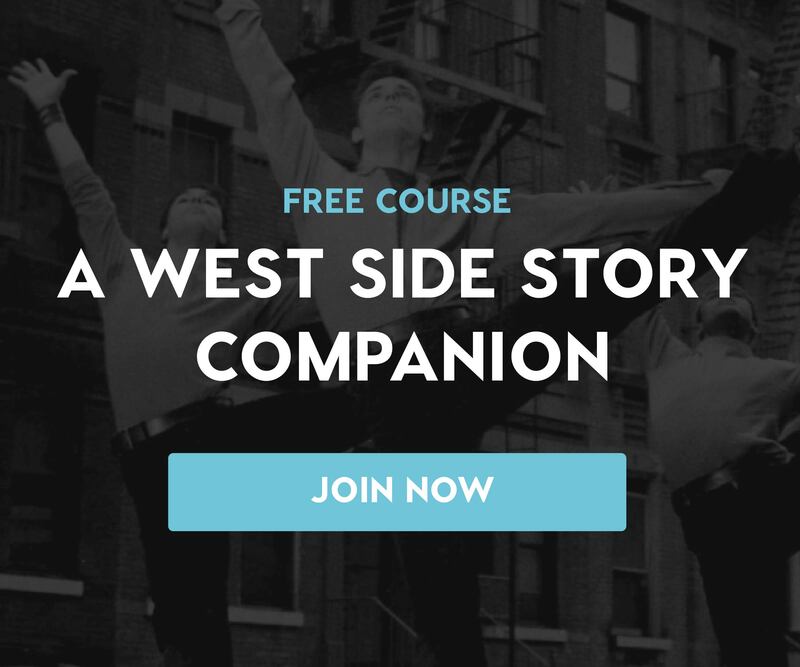 You’ll want to take notes as you read, but it’s written with musicians in mind. The details are really well-explained for a book under 200 pages long! Designing Tube Preamps for Guitar and Bass by Merlin Blencowe — Merlin is a respected voice in the tube amp DIY community, and has a great website worth checking out as well! The Unofficial Hot Rod Deluxe Owner’s Guide — This site was what got me started in high school. Lots of articles from biasing practices to mods and replacement speaker suggestions. “ToobAmps” Subreddit — A community of people modding, building, and designing tube amps. There’s also some great info about audio amplifiers in addition to guitar amps. EL34 World — Lots of articles: schematics, building articles, and helpful links for research. Uncle Doug — I’ve saved the best for last. If you’re looking for a YouTube channel on amps, this is the one. Extremely helpful videos on building and modding amplifiers, and Doug often has hilarious sidebars with his dog, Rusty. Good luck and share your amp-buiding projects in the comments below! Peter Flom is a Production Manager of the Repertoire Development department at MakeMusic. A graduate of the Berklee College of Music, Peter has previously worked at KMA Studios in New York City, and in MakeMusic’s Customer Support department. He now spends most of his days developing new content for the Finale and SmartMusic computer programs, and has worked with many composers from Frank Ticheli to Goordon Goodwin. He also is a freelance arranger and engraver, and plays a mean guitar when nobody's watching.